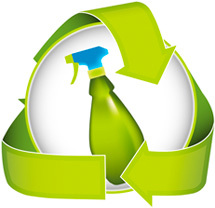 We consciously strive to support long-term ecological balance through our cleaning services. One of the ways we achieve this is by taking great care, wherever possible, to source products that aren’t harmful to the environment and don’t deplete natural resources. Our range includes products certified by third-party eco labels, which have also been formulated to reduce potentially harmful impact on human health as well as the environment. However, all the products we use are high performing, and combined with the latest cleaning technology, deliver the best cleaning results. Our Eco accredited supplier partners make major contributions to the environment, as well as to the safety and wellbeing of our planet. "We highly recommend Paragon – their cleaners are very efficient and we 100% support their policies for a greener environment." Delphis Eco products are accredited by the EU Ecolabel. Recognised throughout Europe, EU Ecolabel is a trusted voluntary label promoting environmental excellence. It can be displayed by products and services with a reduced environmental impact throughout their life cycle: from the extraction of raw material through to production, use and disposal. Innu Science products are certified ECOLOGO and the range has several that are certified in Europe. ECOLOGO is one of the world’s strictest environmental standards. The certification demonstrates Innu Science’s commitment to providing products that meet the programme requirements for quality and environmental performance. Selden Eco Flower range Selden's commitment to ethical, environmentally sound production methods make sure their products are guaranteed green and they are EU Ecolabel accredited.